the Mato (Mat'o) was actually not made by Tesla, but by Statny majetok Zavadka. It was a clone of the PMD-85 with some modifications (something between PMD85-1 and PMD85-2). It had different adressing modes, three user modes (calculator, program and graphics), different load/save method (programs could be read form tape via special software) and changed keyboard layout (fewer keys and special CONT, Shift and STOP). Two version were sold, one with built-in debbuger and BASIC, second with three built-in games; they came either fully assembled or as a build-it-yourself kit. Thanks to Vladimir Kopacek from Czech Republic for information and picture. I designed this computer in 3 month and rewrited the OS and BASIC-G at home, because I conflicted with my "bolshevik director". I made that beside my main job - computer controled washing machines - in Electronics Institute of Strojsmalt Pohorela, which was located in my home city, Banska Bystrica. As a matter of interest, the first prototype was first named "BAPO" from "BAbacov POocitac", then "Babac computer" - "Babac" was name of my director...). Fortunately, for serial production they changed the name into MATO. 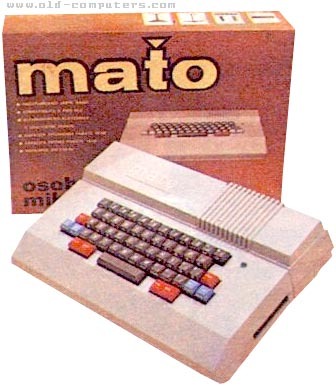 The MATO was designed as single board computer, full compatible with the PMD-85 (only data record protocol was different). The first prototype saw the light in July 1988. First 50 pieces were made in February 1989 and serial production began in August 1989. More than 5500 pieces were made in the Statny Majetok Zavadka factory. The production finished in 1992.
see more Tesla Mato Ebay auctions !